Mike Rathfon posted a fun blog last week about the cool things that happen on Thanksgiving morning. I decided to continue with that vibe, but turn my attention to what happens that afternoon. How many other countries can lay claim to a legal holiday that’s devoted to parades, turkey, naps, and football? Now, I like parades, naps, and football as much as the next gal, but the turkey (and actually, all the other goodies that go along with it) is the highlight of MY day! My curiosity sent me searching for some info about my tasty friend, but I discovered that even though the turkey is the star of the show on the Thanksgiving dinner table, he lives a somewhat downcast existence before his brush with greatness. Do you know why the male turkey is often referred to as “Tom” Turkey? 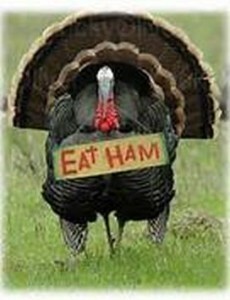 Rumor has it that Ben Franklin was mad at Thomas Jefferson for opposing his idea to have the turkey as our National Bird, so good ole’ Ben mockingly called the turkey “Tom” after Mr. Jefferson. Turkeys have great hearing (but no external ears,) a poor sense of smell, and a bad night vision. Turkeys can also have heart attacks – turns out that turkeys in fields near the Air Force test areas over which the sound barrier was broken were known to drop dead from the shock of passing jets. Poor Tom! Age is a determining factor in the taste of a turkey. Old, large males are preferable to young toms as young tom meat is stringy. The opposite is true for females – old hens are tougher birds. According to the USDA, more than 45 million turkeys are cooked and eaten in the US at Thanksgiving – that’s one-sixth of all turkeys sold in the US each year. Hang in there Tom – maybe you’ll be the lucky guy who receives a Presidential pardon this year! 1. According to the Guinness Book of World Records, the largest pumpkin pie ever baked weighed 3,699 pounds and measured more than 20 feet in diameter. 2. It is estimated that over 40 million green bean casseroles will be served on Thanksgiving. 3. The average American consumes approximately 3,000 to 3,500 calories on the Thanksgiving meal alone – that doesn’t include all the snacks before and after the football game!